There are a number of ways to find the CSS3 for a library or generator. The easiest way is for the developer to provide it to you directly. 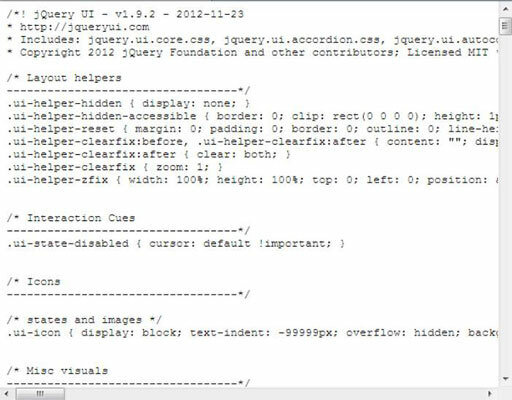 For example, when you work with jQuery UI, you must include a link to the CSS as part of using the library. The href attribute points you to the CSS for the library. When you plug this URL into your browser, you see something like this code. When a vendor doesn’t provide the link to you directly, you can often find information about the product on another site. There’s strong support from a variety of sources for tweaks on third-party libraries and generators. In many cases, all you really need to do is find the right support group, site, or forum (such as, Stack Overflow). You can select the file you want to view from a drop-down list box. 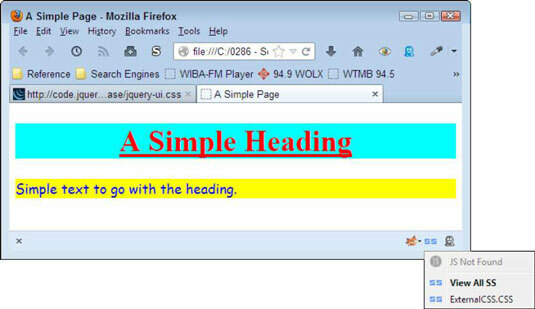 This shows the ExternalCSS.HTML example; JSView correctly tells you that it has one CSS file attached, ExternalCSS.CSS. In order to view the CSS, you select its entry from the list. The code usually opens in whatever program your browser provides for viewing source code. Using a third-party tool like this makes it possible to locate all of the external links quickly and reliably. In addition, you can open more than one of the external links at a time. It’s important to understand that real people, often individuals or small companies, create these libraries and generators. If you can’t find any other source of information about the library or generator — and really do need to make modifications or tweaks for some specific purpose — try contacting the makers of the product you’re using. They’re obviously interested in their product and would likely want to hear your ideas (a few won’t, but that’s the exception, not the rule). The best thing to remember is to try to locate another source of information first and only then ask for help from the product’s creator. However, don’t be afraid to contact the product’s creator — the worst that can happen is that the person will say no.